William Hannah (1891 – 1961) was born in the mining village of Blackburn, West Lothian. Having started on the mouth organ as a boy, he became well known as Scotland’s premiere melodeon player by the end of the First World War, during which he served in the Argyll and Sutherland Highlanders. His role in the development of the modern accordion was an important one. William Hannah was a prolific recording artist with companies such as Parlophone and Columbia, and a celebrated band leader in the 1920s. He was a major influence on Jimmy Shand, although the man and his contribution to Scottish music have been largely forgotten. 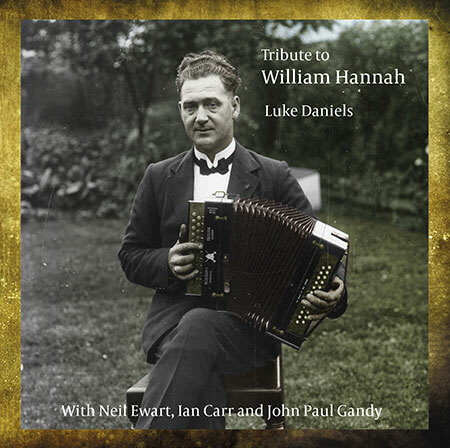 The album features Luke Daniels (melodeon), Neil Ewart (fiddle), Ian Carr (guitar) and John Paul Gandy (piano). The music throughout the album is outstanding. Painstakingly transcribed from early 78rpm and wax cylinder recordings, Hannah’s exciting music and exceptional playing has been faithfully reproduced by four of the UK’s finest traditional players. A Wilkinson Excelsior c1927 (Hannah’s own signature instrument) was restored specially and played on this recording along with an earlier model used by Daniel and Peter Wyper c1909. The assistance of Theo Gibb, accordion repairer and restorer, Ian Cruickshank, band leader and accordionist, Charlie Todd of Peebles Box & Fiddle Club and archivist, Bob Witney and Josh Dickson of the Royal Conservatoire Scotland all contributed significantly to the project. The financial assistance of Creative Scotland is also acknowledged. The album was recorded at the Royal Conservatoire Scotland, produced by Luke Daniels, and mixed and mastered by Bob Witney. The sleeve design is by Gael Music and Designfolk. A wonderful tribute to Hannah.